Rev. Eddy went home to be with the Lord on September 12, 2018 at the age of 94. 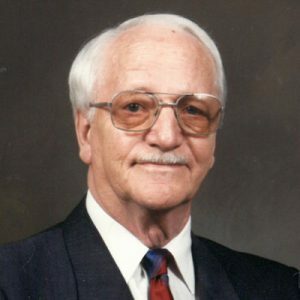 He is survived by his daughter Lucille (Russ) Carlson; son Bill (Gail) Funk; 5 grandchildren; and 9 great-grandchildren. He is predeceased 5 brothers and sisters. Eddy served in WWII, and then met his wife-to-be, Mabel, at the Moose Jaw Post Office. They were married 60+ years until she passed away in 2007. Eddy and Mabel served in Ministry for his entire career – first in the ACOP, and then with the PAOC. He will be remembered as a friendly, outgoing, well-dressed, dapper gentleman who loved the Lord and loved others. He will be missed, but fondly remembered. A Funeral Service will be held on Wednesday, September 19, 2018 at 1:00 pm at the chapel of Springfield Funeral Home, 2020 Springfield Road, Kelowna. In lieu of flowers, donations may be made in Eddy’s name to Evangel Missions, c/o Evangel Church, 3261 Gordon Drive, Kelowna, BC V1W 3N4. THIS SERVICE WILL BE LIVE STREAMED/BROADCAST WEDNESDAY, SEPTEMBER 19, 2018 AT 1:00 PM. The service for FUNK, Rev. Eddy is scheduled for Wednesday, September 19, 2018 at 1:00 pm. Below you will find the map for the service location and the contact information should you have any questions. A thankful heart and many fond memories of Pastor Funk and his family. Just joined in the service. Great to hear the testimony of your Dad. What a great Christian heritage he has passed on to his family. Lucile and Billy, I just found the information about your dad. My heart aches for your loss and on behalf of all the Wikman family , who were blessed to have him for our pastor in Melfort Sk, please know we have always remembered his ministry in our church and our family. I have some stories both of rejoicing and humor I wish I could share with you but please know, your dad, Pastor Ed Funk is loved by us. I would like to give my condolences for your loss. I was saved under Pastor Funk’s ministry and babysat his children sometimes. Loved your parents very much.